Here are a couple of polishes from the Pretty Serious - Christmas without Snow collection. 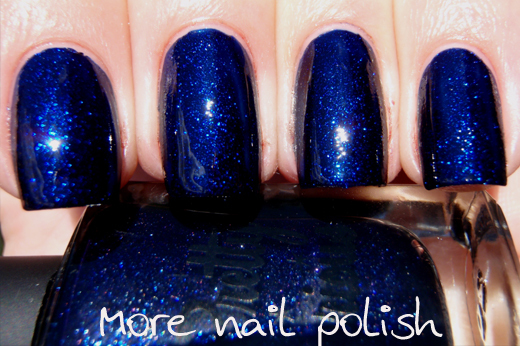 Hot Summer Nights - This one is a deep, dark blue jelly. It's a bit darker than my photos show, which were taken in full sun so they really bring out the dense glittery sparkle. Although it's dark, you can definitely tell its still blue, and not black. 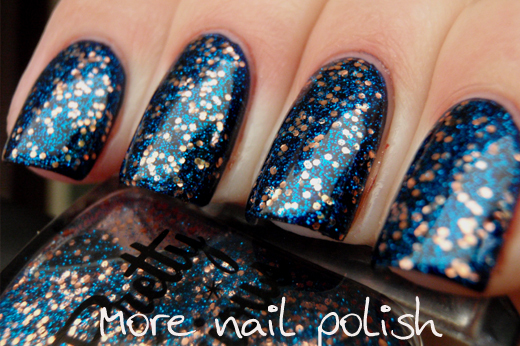 The glitter particles are really dense and the finished look is really glamorous and sophisticated. 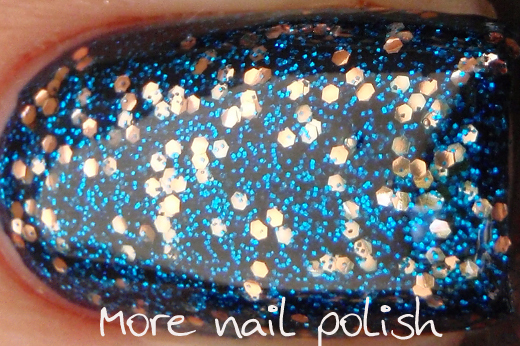 Because of the fine glitter in this, I found it was a little textured so I put two layers on top coat on. Twinkling Lights - These two are perfectly paired with each other, in fact that is exactly how Kaz designed them. This is one coat of Twinkling Lights and the photos are taken in the shade. You can see the base colour is much darker in the shade, and almost looks black. But when the light hits it you see the dark blue sparkle shining though all the small aqua blue glitters and copper hexes. Ahh I love this ! So beautiful and the glitters really do look like twinkling lights! Absolutely gorgeous!! Perfect photography to show these two off at their best. 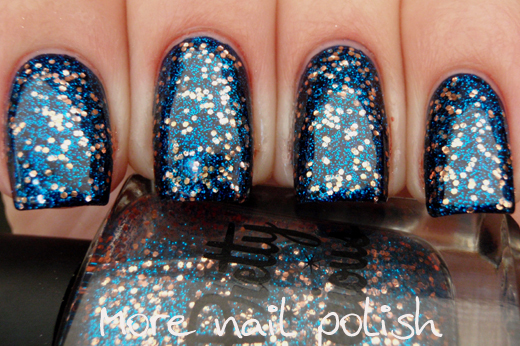 A really pretty combination of glitters in Twinkling Lights. Beautiful swatches! 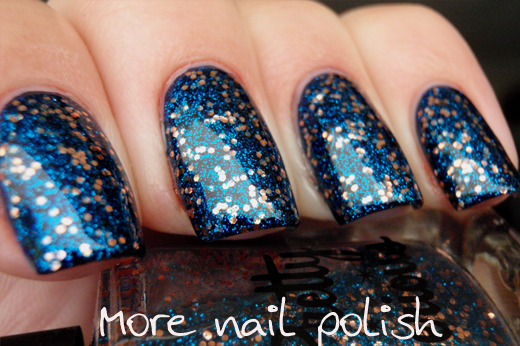 These polishes are gorgeous! I'm amazed by these swatches. 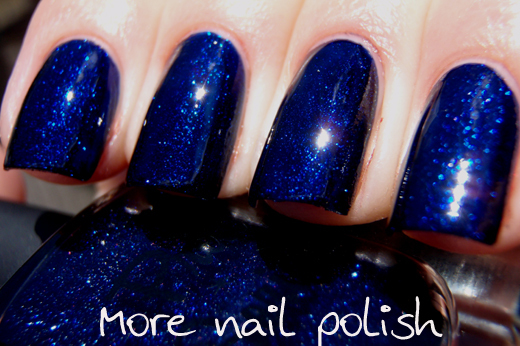 These polishes are absolutely gorgeous!!! 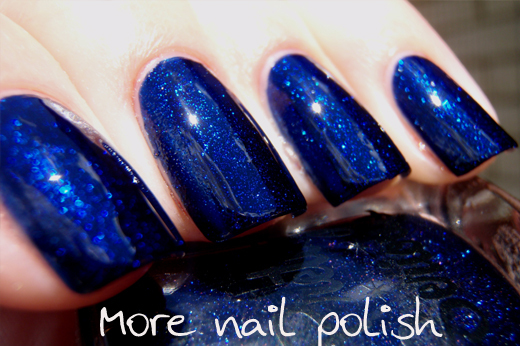 What a gorgeous sparkly polish! Ooo I love Twinkling Lights!! So gorgeous! I cannot wait to receive this collection!! Gorgeous. I didn't know Twinkling Lights was copper!! Oh I loved it!!! it´s amazing, so perfect!! !